Equimax Tabs contain ivermectin for routine worm control and praziquantel one of the world’s most effective tapeworm treatments. Ideally Equimax should be used at the beginning and end of the grazing season to provide maximum control against roundworms, tapeworms and bots in the spring and autumn ensuring your horse starts and ends the year as free as possible from worm infection. The product can be used safely in stallions. Do not use in foals under 2 weeks of age. Do not use in mares from which milk is taken for human consumption. Withdrawal period(s) Meat and offal: 35 days. Do not use in horses known to be hypersensitive to the active ingredients or any of the other ingredients. Care should be taken to avoid the following practices because they increase the risk of development of resistance and could ultimately result in ineffective therapy: too frequent and repeated use of anthelmintics from the same class over an extended period of time, underdosing, which may be due to underestimation of body weight, misadministration of the product, or lack of calibration of the dosing device (if any). Ivermectins may not be well tolerated in all non target species. Cases of intolerance are reported in dogs, especially Collies, Old English Sheepdogs and related breeds or crosses, and also in turtles and tortoises. Dogs and cats should not be allowed to ingest spilled tablets or have access to used packaging due to the potential for adverse effects related to ivermectin toxicity. Wash hands after use. Avoid contact with the eyes. In case of eye irritation, seek medical attention. Do not eat, drink or smoke while handling this product. Keep out of the reach of children. In the event of accidental ingestion, seek medical advice and show the leaflet to the physician so that he knows what you have taken. Colic, diarrhoea and anorexia have been reported in very rare occasions post treatment, in particular when there is heavy worm burden. In very rare occasions, allergic reactions such as hypersalivation, lingual oedema and urticaria, tachycardia, congested mucus membranes, and subcutaneous oedema have been reported following treatment with the product. Horses may be slaughtered for human consumption only after 35 days from the last treatment. Not to be used in horses producing milk for human consumption. Prescription required product- Homeovet Vet.Practice free prescription service. 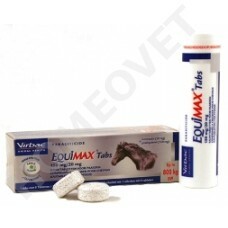 May be fed on their own like a "treat" or mixed with feed, making worming stress-free for horse and owner. The dosage is just one tablet per 100 kg body weight. Present the tablet in the palm of your hand. Repeat this gesture until the complete dose has been administered. During the initial administration, the tablet can be mixed with a small amount of food or a treat, to increase the acceptance by the horse. Treatment for encysted redworms should be done at least once per year. Treatment for tapeworms should be included in the autumn and spring. Rotate Wormers to prevent the possibility of drug resistance forming for a particular drug group. Do not underdose as this can encourage resistance. Use a weight tape. Virbac Equimax Wormer Ivermectin-Praziquantal paste. A2 Deworming package including anti tapeworm treatment for horses.